← Do LHINs need boards at all if they are simply to be the arm of the Ministry? 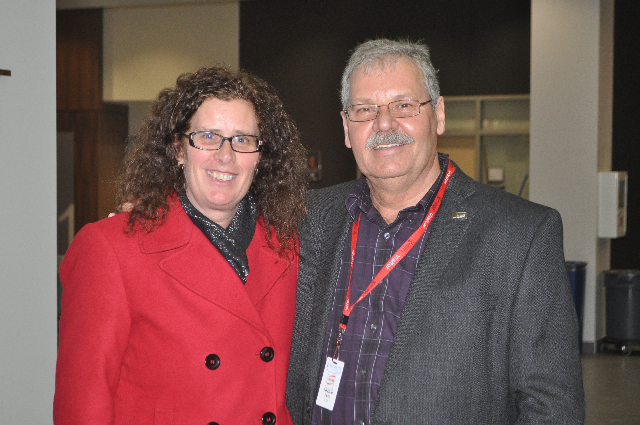 Local 152 President Kim McDowell in St. Thomas yesterday with OPSEU President Warren (Smokey) Thomas. To be a patient here you not only have to have a mental disorder, but to have come in conflict with the law. The Southwest Centre for Forensic Mental Health Care opened in St. Thomas last year as the first phase of a two-part restructuring of mental health services in the region. The second part, a new psychiatric hospital in London, is expected to open in 2015. Both are public-private partnerships (P3), placing a private corporation in charge of the facilities but not the clinical services delivered within them. Touring the facility yesterday with OPSEU President Warren (Smokey) Thomas and Local 152 President Kim McDowell, we asked about worker safety in the new building as a specific concern was being raised about a door to a seclusion room that forced staff to bend over to look through a waist-high opening used to pass through medications. Despite its forensic designation, this may possibly be the safest psychiatric hospital in the province. As we were told, there are very few “codes” here – codes being emergency broadcasts used within the hospital to summons help or raise an alert. Staff at the Centre partly attribute that safety to the hospital environment. Patients have their own rooms – no sharing, no communal ward rooms. Each room has its own bathroom, including a shower, as well as a small TV and DVD player. The facility was deliberately designed so that all patient rooms would have a large window with a view – many looking at an attractive courtyard in the centre of the facility. There is natural light through the building. Patients have access keys to the doors of their rooms, which are kept locked. That means unwelcome visitors cannot simply walk in. Depending on their status, patients can also use their access key to gain entry into other parts of the hospital. We were told some patients were previously reluctant to use group showers, but bathe daily now that they can do so in the privacy of their rooms. Despite a complement of 80 patients, the hospital is noticeably quiet. During the tour we were told that the quiet room is seldom used – likely because the whole hospital feels like one big quiet room. That doesn’t mean there aren’t activities being carried on. Patients have access to a variety of recreational facilities, including a gym, a separate exercise room, a library, a music room, computer access, a chapel, family visiting rooms and bright dining rooms on each ward. When we passed by one such dining room there was a game of cribbage taking place in between meal times. For those who wish to venture beyond their rooms, there are also many TVs available to watch in the company of others. We were also told that St. Thomas is over-complement on its present staffing – likely another reason why its incident rate is low. As psychiatric hospitals across the province are struggling with unacceptable levels of violence, we couldn’t help but be reminded of Dr. Heather Stuart’s observation that such violence may be connected to the environment patients find themselves in. The Queen’s University researcher says patients with mental illness are no more likely to be violent than any other segment of society. Is the St. Thomas hospital on to something that other psychiatric hospitals should be looking at? The union local said it had input into the design of the new facility and staff had pushed for an apartment within the hospital to allow patients to experience independent living under observation before being cast out into the community. While the apartment is spartan (as is much of the building – the hospital has yet to hang much of its stock of artwork brought over from the previous building), it is sadly going to be much more attractive than what most patients can afford in the community under the Ontario Disability Support Program. The shelter allowance for ODSP is just $445 a month. Like most new buildings, staff is still discovering shortcomings in the design, such as the previously mentioned seclusion door. This being a P3 building, these issues will likely take longer to resolve than under a traditional publicly-owned facility where there isn’t the division between clinical and physical plant control. Any alterations are also going to be very expensive because the service provider won’t just look at the cost of a specific alteration, but the cost of maintaining that alteration for 30 years. Kim McDowell says that the issues being raised by staff in the St. Thomas building are being used to make adjustments while the London mental health facility is still under construction. Planners in Kingston should also take note of the design success at St. Thomas after the province recently awarded a 30-year contract of more than $900 million to replace two local hospitals – rehab and mental health – operated by Providence Care in that city. The controversial new 270 bed facility – awarded to a consortium that includes EllisDon Corporation, Fengate Capital Management Ltd., Parkin Architects, Johnson Controls and Scotia Capital, is expected to open in 2016. Like St. Thomas, the London and Kingston facilities will offer far fewer beds than the aging structures they are replacing, raising questions about the lack of capacity planning for the future. As we were told, it’s not the beds that are missing, but the support for the patients who need them. The Southwest Forensic Centre for Mental Health Care presently has funding for 80 beds with an ability to expand to 89 – or less than two additional beds per ward. With a wait list to get it, it is hard to understand why the province has not already opened those additional nine beds rather than leave forensic patients stranded in crowded corrections facilities? 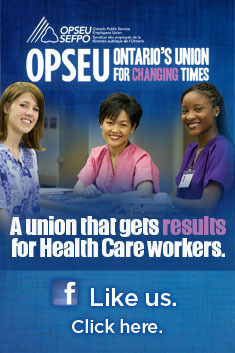 The bed shortfall is usually justified by the province’s insistence that community-based care is the way of the future. How that gets squared in a forensic environment is hard to understand. We have previously raised with the South West LHIN the point that while the province has been steadfast in marching towards the reduced mental health bed targets set by the 1990s Health Restructuring Commission, it has been far less dedicated in providing alternative resources in the community. In some instances, the situation in the community has gotten worse. While in London we also visited with the departing vocational staff at Andrew’s Resource Centre. We wrote about the Centre last month questioning why such a valuable service was being closed, denying long-time patients the ability to earn a small amount over and beyond their ODSP support by performing various contract jobs given to the hospital by the local business community. The clients no longer have their “jobs” to come to anymore, although many continue to show up for rehab help. The Centre will be completely closed at the end of March. Taking place in Health Minister Deb Matthews’ backyard it is perhaps a bit surprising that nothing was learned from the closure of the parallel workshop in St. Thomas. In that case only four of the 85 clients using that workshop went on to be employed by Goodwill despite the fact that the charity inherited much of the St. Thomas equipment. Workers tell us they have sent on names and CVs from the existing Andrew’s Resource Centre client list, but so far none have been hired. The evidence would suggest the drive to transfer this function to a charitable non-profit is a total failure, yet the hospital, the LHIN, and the Ministry all appear to be ignoring the obvious. Aren’t we supposed to be learning from our mistakes? Yesterday we heard the common complaint that such services are victimized by austerity politics because these patients and their families have little political influence. Shouldn’t we be judging these politicians by their willingness to simply do the right thing? Andrew’s Resource Centre is not in an attractive new hospital with colourful furniture and state-of-the-art technology, such as the expensive video-phones on the desks of staff in the new St. Thomas facility. The resource centre’s steel tables look well-worn. The walls leading to the basement are peeling. Neither is there a private company telling them they can’t hang from the ceiling the colourful mobiles made by patients. Those mobiles break up the industrial grey gloom in the aging building. We looked at five staff members yesterday with a combined experience of nearly 200 years in supporting clients from the community at this vocational workshop. Tossing them aside feels like more than just a cold-hearted business decision; it feels like vandalism to the mental health supports the community has relied upon for a very long time. This entry was posted in Uncategorized and tagged Andrew's Resource Centre, Deb Matthews, Health Restructuring Commission, Kim McDowell, Mental Health and Addictions, OPSEU Local 152, South West LHIN, Southwest Centre for Forensic Mental Health Care. Bookmark the permalink. Interactive frank discussions of the Andrews Resource Centre Workshop closures,signifigantly impacts the mental health patients. Most have severe and persistient complex barriers that make working for minium wage competitive jobs challenging. Though there are community resources,they do not meet the needs of this patient population.meaningful work you take pride in can mean 2-3 hours a dthewsy,week or month.it provides a reason to get up in the mornings. I would like to see Deb Matthews gather statistical information that accurately reflects the broad gap in this growing complex issue. Too many mental health patients are impacted,that once could say,I have meaningful work. Now I have none. The great work of supportive vocational staff have made a difference in our community.where once the comments were going to work see you later,now it is I have no place to go.